One of my favorite tips for supporting a healthy lifestyle is being prepared. When you are prepared with wholesome options, you are a lot less likely to grab something on the go, and we all know “on the go” food options usually mean compromising our health. Personally, learning to be prepared has been one of the best transitions I have made in my life and I always try to encourage this practice to my clients and friends. Keeping fresh fruit or trail mix in your bag, pre-washing your greens for the week, or making a green smoothie the night before are some of the many ways to make healthy living more manageable, especially for those with busy days. So, I thought we could take it to the next level this week and talk about being prepared while traveling. With my back and forth lifestyle between NY and FL, I spend a decent amount of time in the air. As I walk through airports and look around, I get upset at the lack of nutritional food that is available. There was a time when I wasn’t prepared… I would show up at the airport, get through security, grab a slice of pizza or some “brunch” meal and woof it down while I waited for my flight to board. Once I found my seat on the plane, I felt bloated, sluggish, and super uncomfortable. Land. Book another flight. Repeat. I used it as an excuse. Because there were no other options available, I HAD to eat these types of foods because I HAD to eat (sound familiar?). When I started transitioning my decisions away from a self-sabotaging life, I realized that it was REALLY HARD to find healthy food options in airports. So, I continued to take control of my well-being and I started to prepare my own. Here is a little about my travel essentials, both for my body and my mind. Water. Drink more water, especially when traveling. Flying dehydrates us, so it is extra important to drink more water before, during and after. Dehydration can cause fatigue, unwanted cravings, unpredictable emotions, and usually stops up our pipes. Bringing a water bottle ensures that you will have water on you, and won’t have to spend $3.50 at Starbucks for a small bottle. After making it through security, I will stop into a restaurant and ask the bartender to fill up my bottle. Fruit. Apples, bananas and oranges are great fruits to throw in your bag because they can handle a little bump and toss. You can also pack a container of berries or cut up fruit to enjoy before or during your flight. Energy bars. Choosing an energy bar that has few ingredients is a great way to keep yourself fueled without ingesting so many of the harmful ingredients and extra sugars that are in so many granola/protein/energy bars. Some of my favorite brands include LaraBar, Greens Plus and Go Raw. Green Powder. No time for your green juice or smoothie? Amazing Grass makes these wonderful travel packets of their freeze-dried veggie and fruit mixes that are packed with nutrition. They are a great second choice when there isn’t fresh organic produce to blend and enjoy. Pack a sandwich. Almond butter, jelly and a sprinkle of cinnamon on ezekiel toast has been my go-to lately because its easy to throw together, not too messy to eat, and doesn’t smell (I made egg salad once, wont do that again). You can also throw leftovers in a container. Journal/Book. Personally, I love to use my alone time on a flight to read and reflect on whatever I have going on at that time. You Can Heal Your Life by Louise Hay is a book that comes with me pretty often because I can re-read chapters and re-do writing assignments and learn something new each time; a new way to love myself, a new perspective, or a new way to practice compassion. Tea. Throwing some tea bags in your carry on will save you the time it would take to stop and purchase a drink and will also let you enjoy a tea that you love rather then having to decide on the limited options on board. For my last trip, I packed Traditional Medicinals “female toner” to help support my feminine system (My monthly “moons” can get a little irregular when I am traveling). Herbs that support immunity, alertness, digestion and stress are also great options. Headphones. Listen to music, listen to white noise, get lost in your favorite book on tape, or watch videos without having to listen to the sound of others. With headphones you have some control over your personal space and the noise that you allow into it, which can be especially helpful in a packed plane. Essential Oils. A little lavender on my wrists and temples helps me to relax and zone out. It sends a signal to my body that it is ok to breathe deeply and turn inward. Packing, catching flights, and the idea of being so high in the air tends to stress me out, so I use this essential oil to bring me back to a calmness, to let go of the stressful thoughts in my head, and just be. Chamomile, sandalwood, peppermint, sage, or grapefruit are other great stress relievers. Chapstick/Moisturizer. It is always good to have some kind of moisturizer on hand to take care of chapped lips, dry, itchy skin, or anything else that can be exacerbated by flying and travel. I love to use vitamin E oil because of its healing properties. Clothes to stay warm. Airplanes can get pretty chilly, so its always a smart idea to pack a sweater, scarf or hat to help keep you warm and comfortable. From my list, what do you think will support you to have a healthier and happier travel experience? 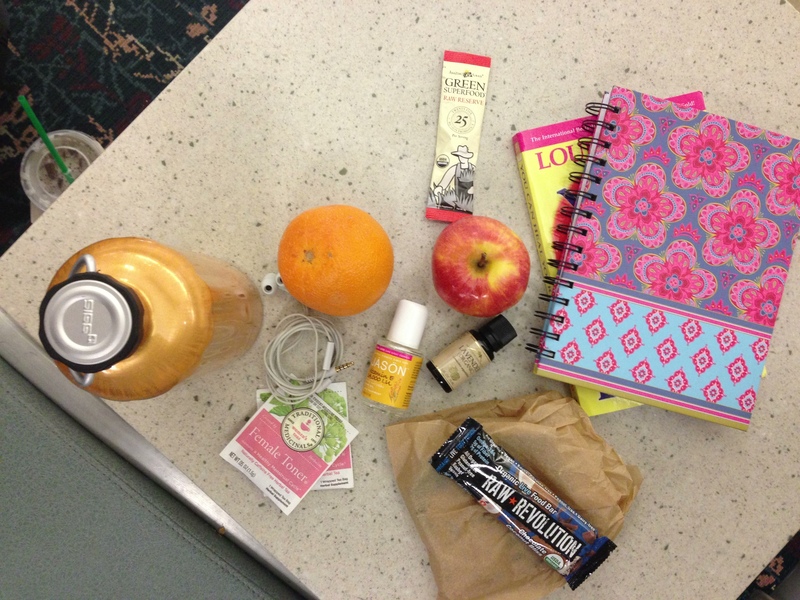 Tags: energy bars, essential oils, green powder, health, journal, prepared, tea, travel. Bookmark the permalink. Great reminder before we head out for some long travel days. Next stop, Belize! But not before I pick up some (new) travel staples! ahhh how exciting!! Have so much fun!! Good advice Amanda. You can always fill your water bottle at the water fountain which is usually located near the restrooms. Also, a pashmina is a good option for packing. You can use it as a scarf, shawl, or blanket. I folds up very small. I always keep one in my bag.